In “Housewifely Arts”, a single mother and her son drive hours to track down an African gray parrot that can mimic her deceased mother’s voice. A population-control activist faces the ultimate conflict between her loyalty to the environment and her maternal desire in “Yesterday’s Whales”. And in the title story, a lonely naturalist allows an attractive stranger to lead her and her aging father on a hunt for an elusive woodpecker. This book is a wonderful collection of short stories that link human experience with animal nature. Whether as a metaphor or as an adjunct to a particular story the animals assist the telling of all of the poignant vignettes that comprise this lovely book. The narrator does an exemplary job of subtly adjusting to the feel of each of the stories. By the way Malachai ( spelling ? ) is a looney tune... my opinion, of course ! forward to that happy day. I highly recommend this group of vignettes of human life. They are placed from different viewpoints, but all are full of life. Highly recommend it!! 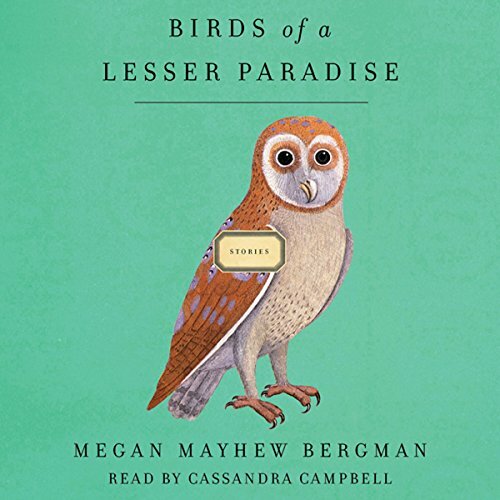 Would you consider the audio edition of Birds of a Lesser Paradise to be better than the print version? The audio was fantastic, but this is the kind of book I'd like to take a highlighter to and underscore a few of Bergman's wonderful turns of phrase. I liked the disfigured vet in the story "Saving Face." None stands out. They were all stellar. Because it is short stories, it is suited to listening in small installments. If you think you don't like short stories, try this book. It may just change your mind. I was aware at the time of purchase that this was a collection of short stories, but found myself feeling as if I was left hanging at the end of each story. Overall I just didn't get the sense of satisfaction from a good read.